Realme 1 vs Oppo F7 Comparison - What's Different? Realme 1 launched in India which comes with Helio P60 Processor, 6GB of RAM similar to Oppo F7. 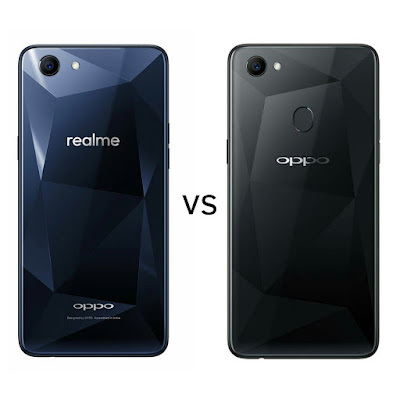 Check out price, specs, features comparison and difference between Realme 1 and Oppo F7. Both phones have has multi-layered metallic and glass back cover that replicates a diamond-like glow and light refractions. Realme 1 has a 6-inch (2160 x 1080 pixels) Full HD+ IPS display whereas Oppo F7 comes with 6.3-inch (2280 x 1080 pixels) Full HD+ 19:9 IPS display both are powered Octa-Core Helio P60 processor with 4/6GB of RAM and 64/128GB internal storage. Realme 1 also comes with 3GB RAM and 32GB Storage both have supported for dedicated microSD card support. Realme 1 has a 13MP rear camera with LED flash and 8MP front whereas Oppo F7 has a 16MP rear camera with LED flash, f/1.8 aperture, and 25MP front Camera, Oppo F7 has Fingerprint Scanner whereas realme 1 does not has fingerprint scanner both phones have Face unlock feature and runs on ColorOS 5.0 based on Android 8.1 (Oreo). Realme 1 comes in Moonlight silver and Diamond black colors priced at Rs. 8990 for the 3GB RAM 4GB RAM costs Rs. 10990 and Rs. 13,990 for 6GB RAM.OPPO F7 comes in Solar Red, Moonlight Silver colors, is priced at Rs. 21,990 and Sunrise Red variant with 6GB RAM with 128GB storage version for Rs. 26,990. Oppo F7 has Notch Display, Fingerprint Scanner which lacks in Realme 1.